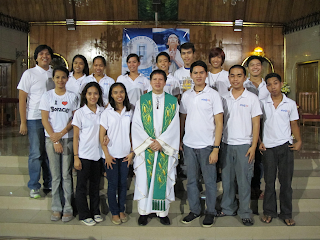 Last December 1, 2012, the San Lorenzo Ruiz Parish (SLRP) Youth Choir sang in ‘Sang Tinig 2012, a choral festival organized by the Bukas Palad Online Community (BPOC) held in the Our Lady of Annunciation Parish (OLAP) in Mindanao Avenue, Quezon City. taya Ako sa Diyos” and “Twelve Days of Christmas”, which was arranged by Senando Angelo Santiago, who is the musical director and instrumentalist of the Music Ministry of SLRP but now on a long hiatus. BPOC maintains ‘Sang Tinig as an annual event aiming to raise funds for outreach programs of the Community. Now on its fourth year, ‘Sang Tinig chose Sta. Clara Mission Community of the Diocese of Caloocan as its beneficiary. Eight other choirs, some professional, some not, participated in this event: Alay Himig, Ave Verum Cantantes, Centro Escolar University Singers-Makati, Coro Cherubino, Intervoices Chorale, OLAP Music Ministry, St. Bernadette Choir, and Vocalismo Choral Group. Aside from the two songs that each choir presented, all nine choirs also sang three songs together on stage at the end of the show, under the baton of ‘Sang Tinig 2012 Musical Director Prof. Lester Delgado, also a composer of liturgical music and BPOC member. of the Philippine liturgical music scene, creating liturgical and inspirational songs that are widespread throughout the entire Catholic Philippines. Examples of such songs are “Anima Christi” and “I Will Sing Forever”, composed by one of its founding members, Fr. Manoling V. Francisco, S.J. The SLRP Youth Choir, headed by Santiago, aims to be an instrument to unify the youth of the parish, at least by means of singing, and currently fields its members from the youth choirs of the Music Ministry, namely Himig SanLo, and Enzo and Gospel Choirs. It sings in various special occasions, liturgical celebrations, and events in and out of SLRP, with its maiden performance being with the University of the Philippines (UP) Kontemporaryong Gamelan Pilipino and the UP Jazz Ensemble in a concert in 2011, and one of the latest in a mass service for the religious communities of the Diocese of Novaliches held in St. Vincent Parish in October 2012. As of the present, the Youth Choir seeks another musical director.